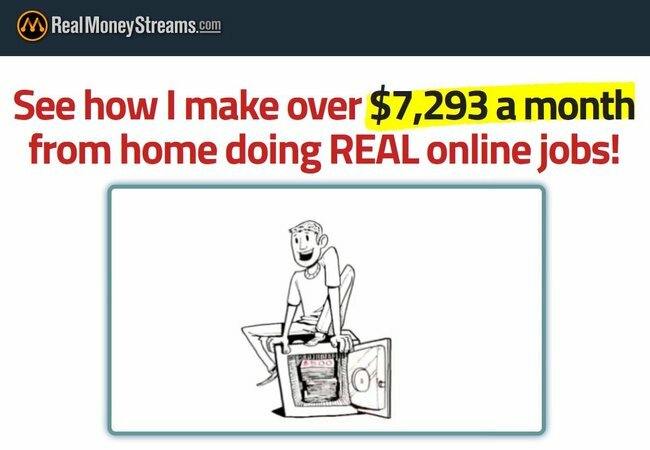 Real Money Streams found at realmoneystreams.com claims to help you make an extra $7,000 a month with online jobs, but it’s just yet another online scam to get your money. 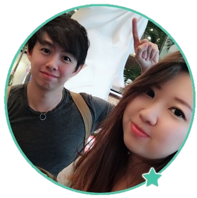 If you are considering to buy it, do take a few minutes to read through this Real Money Streams review to understand what it is all about and decide if you still want to make the purchase. We’ll discuss some common questions such as the sort of jobs you can expect to get from the system, the real earning potential, the real costs involved, and if you’ll be getting the $50 after completing your first job? Can Real Money Streams make you over $7,000 a month? Try to recall – how did you come across Real Money Streams on the internet? Was it from a suspicious email you received in your inbox? A “news article” about a single mom making huge money from the internet? A website sidebar banner? Or simply a pop-up when you were surfing some unrelated websites? In any case, you should be wary about Real Money Streams, because it is one of the more sinister online scams that you can come across on the internet. Apart from giving fake promises about its earning potential, it will potentially cost you a lot more than the initial $37 and result in recurring monthly payments without your knowledge. What about making more than $7,000 a month using their system? Unfortunately it’s nothing more than a highly exaggerated sales gimmick to catch your attention and to make you pay for the scam. What Exactly is Real Money Streams System? These are just sales pitches to make you sign up! To be honest, there are no secrets when it comes to making money online. If you sign up for Real Money Streams system, it will simply introduce you to some online survey sites and paid-to-click websites. These are by no means “online jobs”. You can’t hope to cover your daily and monthly expenses with them, at most you can only earn some pocket money on the side. Keep in mind that not all survey sites are created equal. Real Money Streams introduces some shady survey sites which only benefit the scammers and give them commissions when you sign up and spend time completing surveys. The paid-to-click websites are even worse, you may be spending a lot of time watching advertisements and clicking aimlessly just to earn a few cents a day. I’ve covered some legitimate survey sites before, and you can probably find more by Googling them. While you can make some money from these sites, you will never be able to replace your job with them. If you sign up for a bunch of them and do every survey possible, you may be able to make some good pocket money, but you’ll get bored very soon and you have only so much time to dedicate to online surveys. I have since moved on from completing surveys to starting my own websites and online business for the long term potential. You can read about my progress and results here. What’s worrying about Real Money Streams is not just the overly exaggerated earning potential and sub-par product quality, but also the fake promises and undisclosed costs that are included in the sales material. What’s the Actual Price of Real Money Streams? You may end up paying up to $172 for a lousy product over the long term! The image above was obtained from Real Money Stream’s affiliate website, which illustrates the amount of commissions an affiliate can get for promoting the system. Note that while the price of Real Money Stream program is advertised at $37, you can actually lower it to $17 if you attempt to exit the sales page before purchase. This will trigger a discount to entice you to buy the program. While it may sound good to get extra discounts, this is generally a red flag for an online scam. If Real Money Stream system is really that good, why are they willing to slash the price from $198 to $37, and finally to $17 just to make you buy it? Keep in mind that this is just an initial payment. There are 3 more upsells that follow the initial purchase, each promising to accelerate your progress and enhance the original program. What’s dangerous about these upsells are the hidden monthly charges. Each of them will cost you $17/month, so if you buy into all 3 of them they will cost you a staggering $51/month without adding value to your life. Some victims don’t realized they are being charged monthly until it’s several months later. Can You Really Get $50 Promised by Real Money Streams? Will you really get the $50 bonus? Unfortunately NO. You won’t get the $50 bonus even if you have completed the surveys introduced by Real Money Streams program. The real motive behind Real Money Streams scam is to make a fortune by selling you the program and the upsells, and then giving you a list of survey sites and click-to-paid websites to sign up for. This list consists of affiliate links to the survey and paid-to-click websites, and many of them will not provide any value or generate income for you. But if you sign up on these websites through the links, the fraudsters behind Real Money Stream will get the referral credit and commissions. Ultimately, the ones behind the scam make a ton of money by selling their sub-par program to unsuspecting internet users and making good commissions when they sign up and spend time doing surveys on their recommended sites. On the other hand, the victims are the sole losers as they pay a good sum of money for a lousy product that doesn’t even pay itself back, let alone generating thousands of dollars a month. Is Real Money Streams a Scam? It’s clear that Real Money Streams is just out to get your money. It overly exaggerates its earning potential, keep its real costs and price hidden, and deliver a sub-par product that won’t make you money. The final verdict is YES, THIS IS A SCAM! There are more scams on the internet and sometimes scams are wrapped in other scams, so how can I tell that this is not a scam within a scam? Hey Zephrine, if you are referring to “Real Money Streams”, it is indeed a scam. If you are referring to Wealthy Affiliate, you can sign up for a free account and go through the 10 video lessons and decide for yourself if it’s a scam. OMG I bought it right before reading this review! Can I still get my money back? You can request for a refund via Clickbank since they are the vendor. Remember to quote your purchase ID.